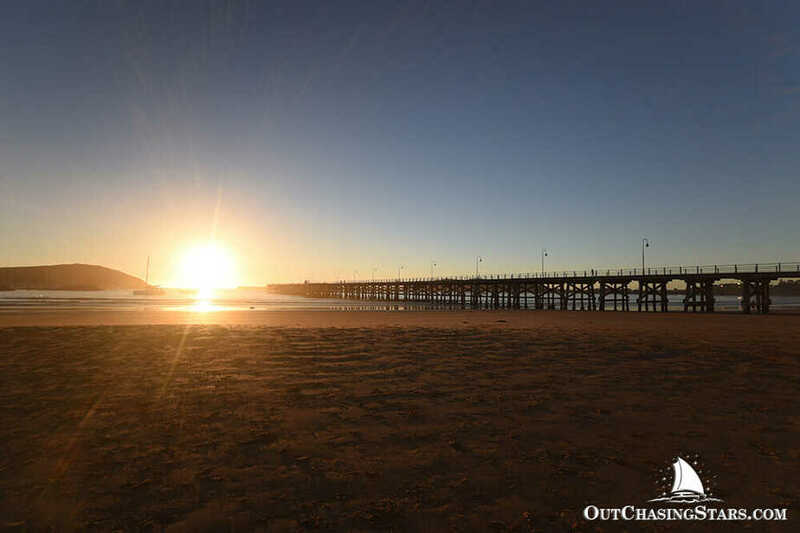 This small coastal city welcomed us to Australia quite easily, and we were excited to get out and about for our first taste of this huge country. 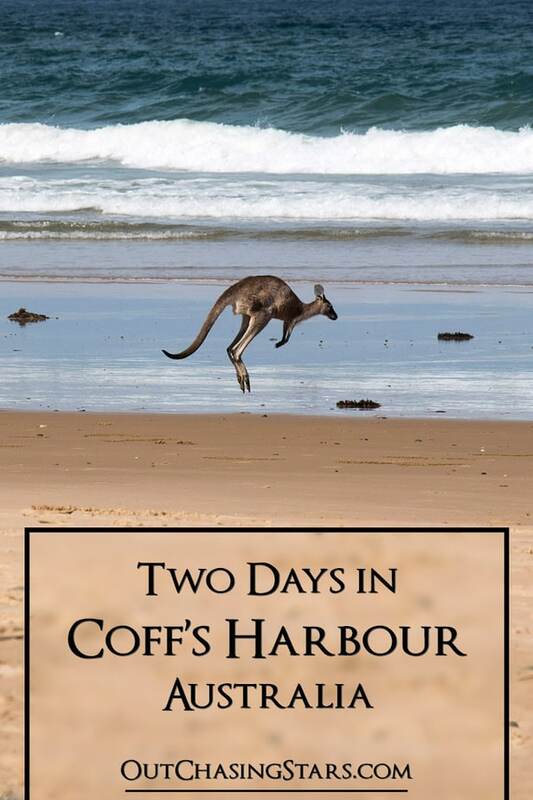 While Australia is big, Coffs Harbour is pretty small. You can fit all these things into two days; one day walking around the shore, and one day in a car rental. And BONUS, everything was free! Hands down our favorite activity! We wouldn’t have known about it except that our neighbors on the dock offered to take us for the 20-minute drive. 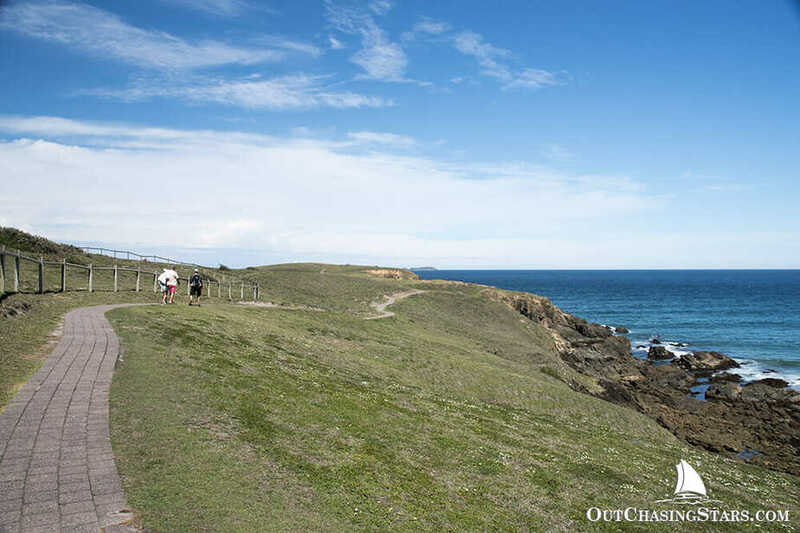 The headlands is located between Moonee Bay and Serenity Beach, and is just a 15-minute walk out to the point. But the absolutely amazing thing? The WILD KANGAROOS! 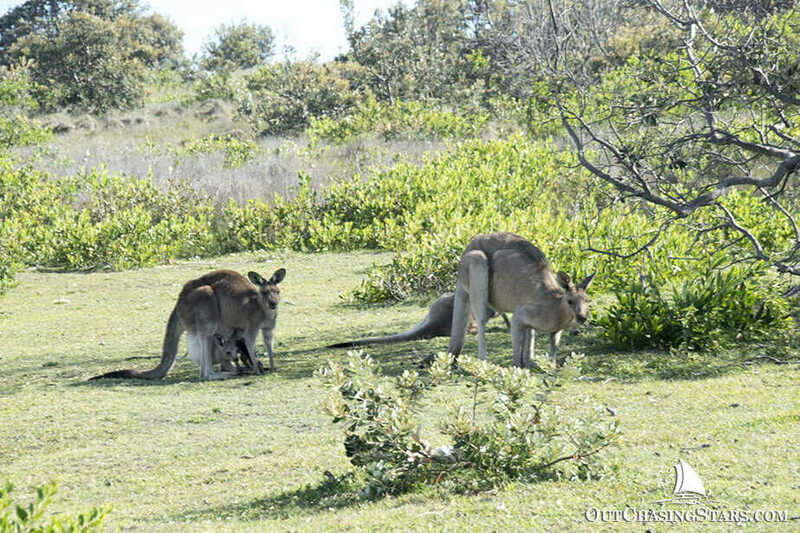 We spotted a few pairs of eastern grey kangaroos here and there but then at the top of the headlands before you turn down to Serenity Bay, there was a mob of about a dozen. Most of them carefully hopped away as we approached, but one stayed right next to the path, within just a few feet of us as we passed. 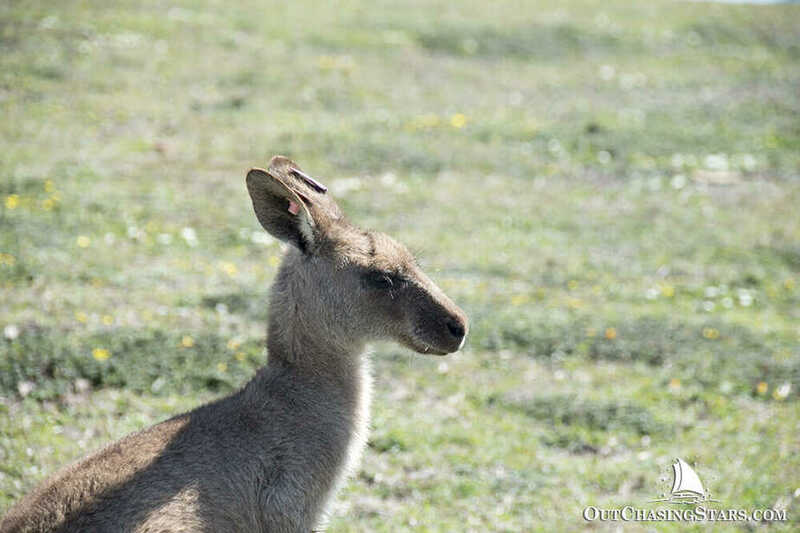 While most of the kangaroos were does, we did see one male and a few joeys. They are so stinking cute and fun to photograph. 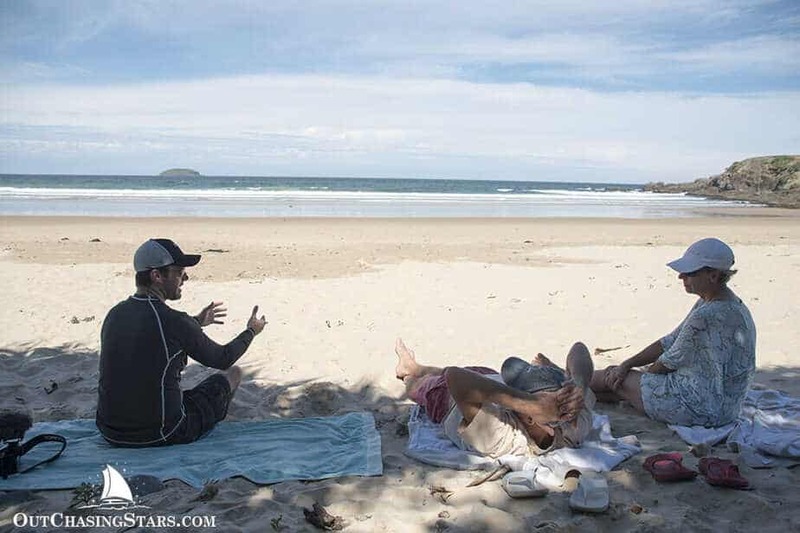 We sat on the beach at Serenity Bay for a while and dipped our toes in the water (Paul went for a full swim – bbrrrrr!). 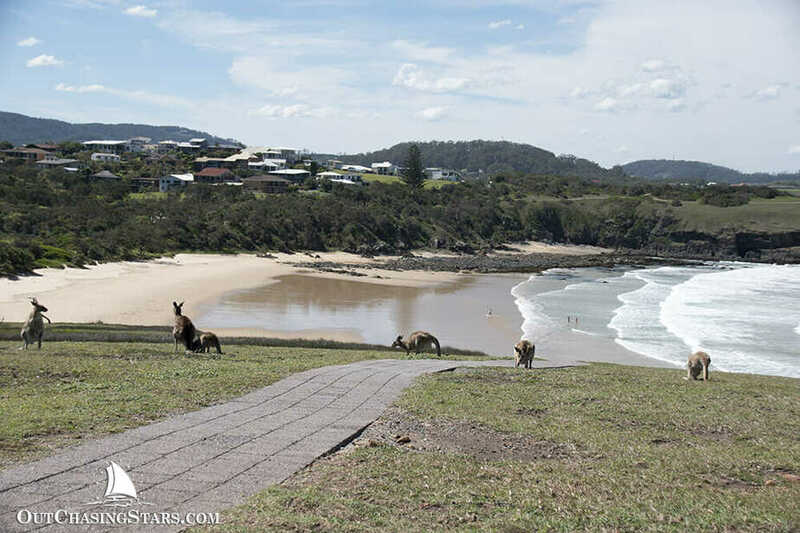 Kangaroos even hopped across the beach while we chatted. Look at Me Now headland. A path through the mob of kangaroos. This is the one that let us get really close. Chatting in the shade with Paul and Deb. 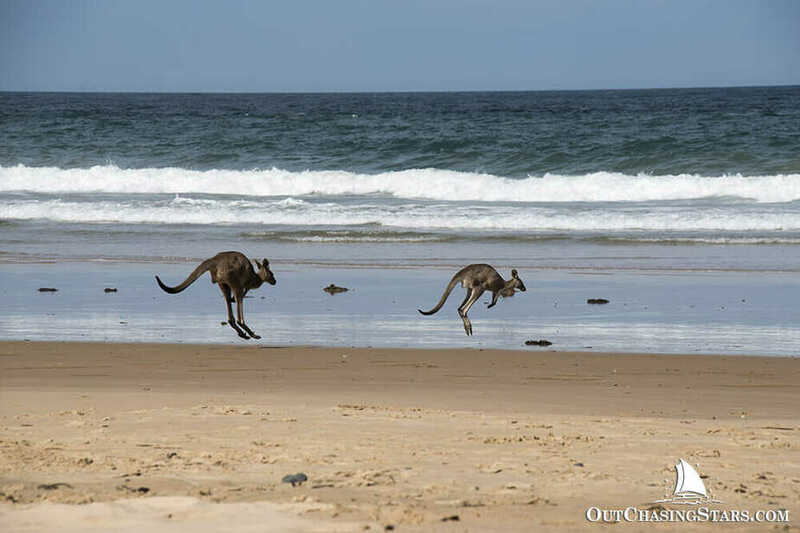 Two roos hopping across the beach! A doe with a Joey (rightside up) and a buck. 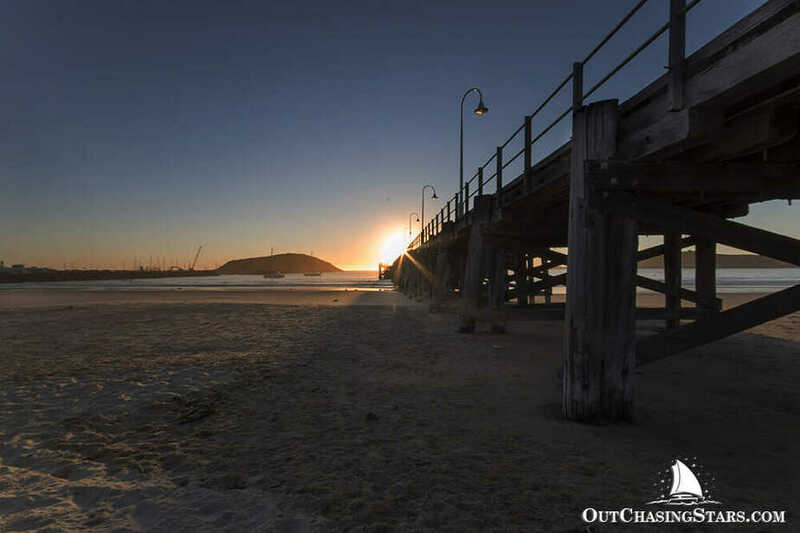 Right next to the marina, Muttonbird Island forms one side of the entrance into Coffs Harbour. The short but steep walk is very popular. We hiked up and over to the Eastern Side lookout once with Marce and Jack from Escape Velocity, and then one evening hiked up to the top to photograph sunset. Apparently we had just missed a guided evening walk led by a ranger that happens once a month. I also hiked to the first bench, about 1/3 of the way up, on a Thursday night to get a view of the Twilight sailing races put on by the yacht club. Why is it called Muttonbird Island? The ground is littered with burrows of the wedge-tailed shearwaters, which were called muttonbirds by early settlers because they tasted like – you guessed it – sheep. In December, the shearwaters had already laid the eggs and were incubating them. You can’t really see the eggs or the birds, but the views are stunning and we enjoyed spotting other birds and even a blue-tongued lizard! 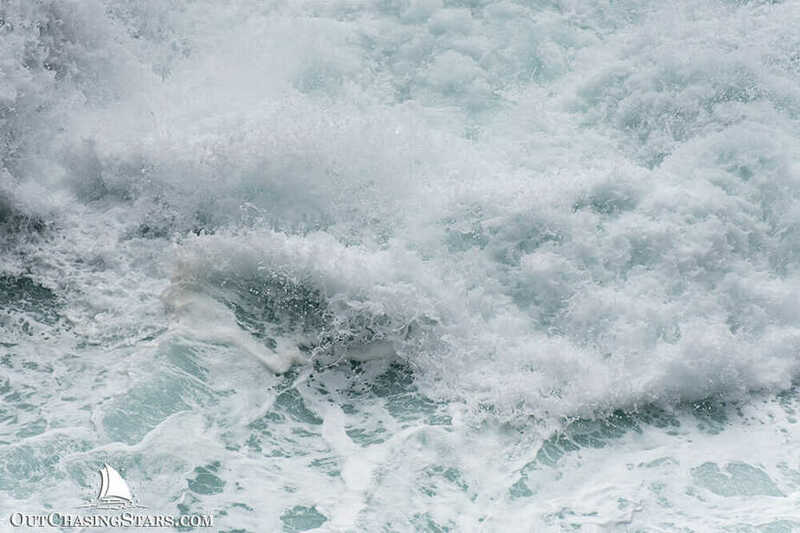 I am not much for abstract photography, but I love the look of the waves crashing frozen in time. 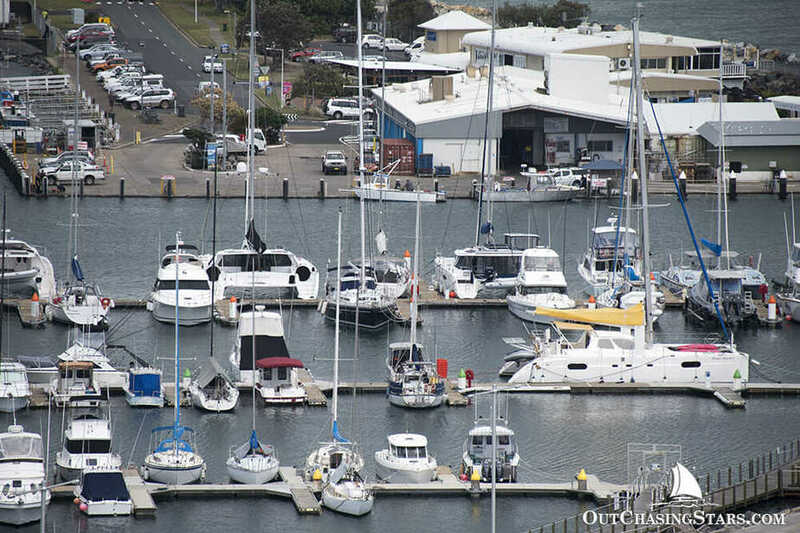 David and I looking back at Coffs Harbour International Marina and Starry Horizons. Jack and Marce. 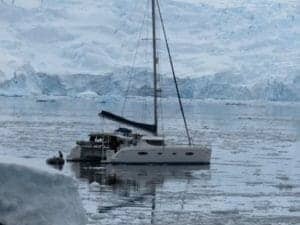 Their boat, Escape Velocity, is at the end of the middle pier to the left of Jack. Starry Horizons chilling with our neighbors, The Countess. 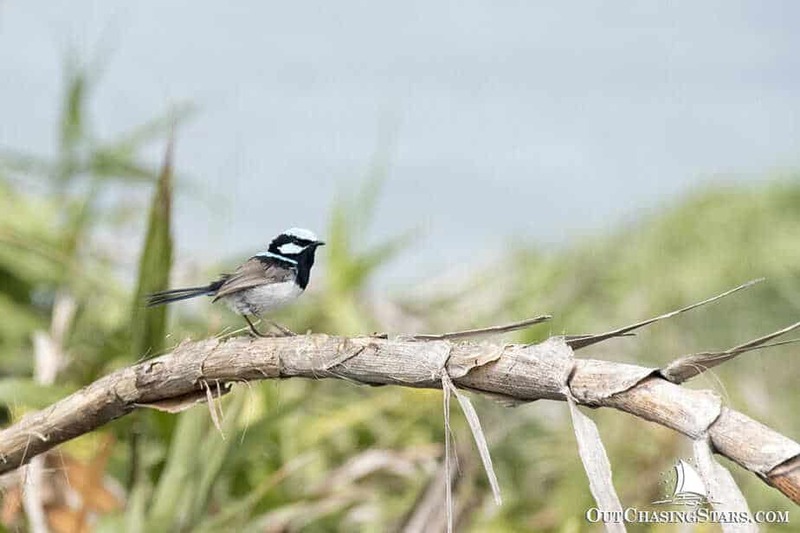 A superb fairy-wren. Love the ice-blue color on his head. 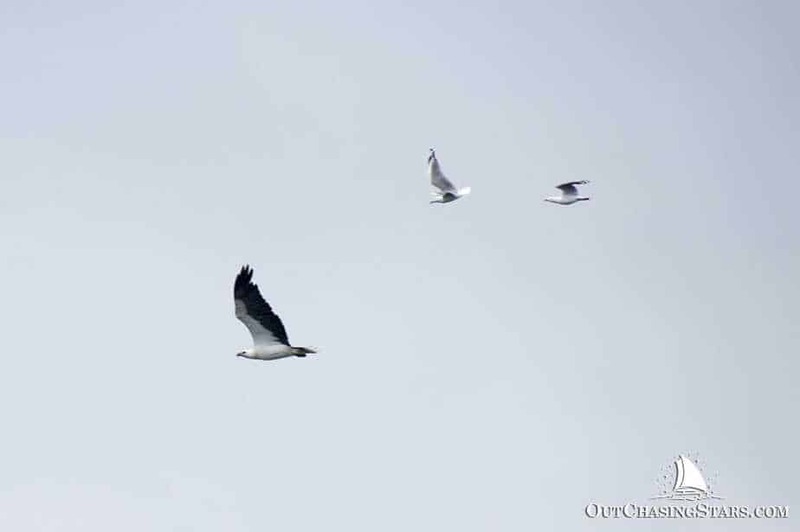 A white-bellied sea eagle, the second largest bird of prey in Australia. With two seagulls for size! Sunset from Mutton bird Island. 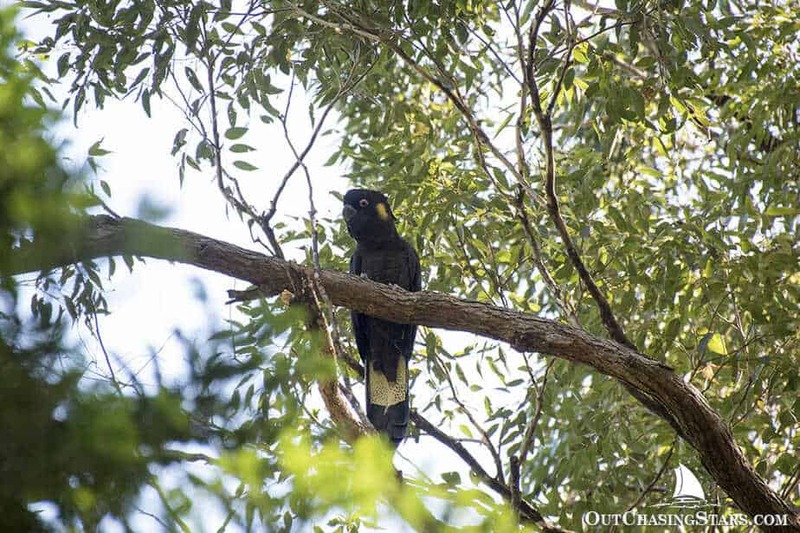 A 20-minute drive from Coffs Harbour takes you to the small Orara East State Forest park, which is in the mountains above the banana plantations. In fact, we even stopped on the drive back down and bought a bag of bananas from on of the honesty stands on the road. 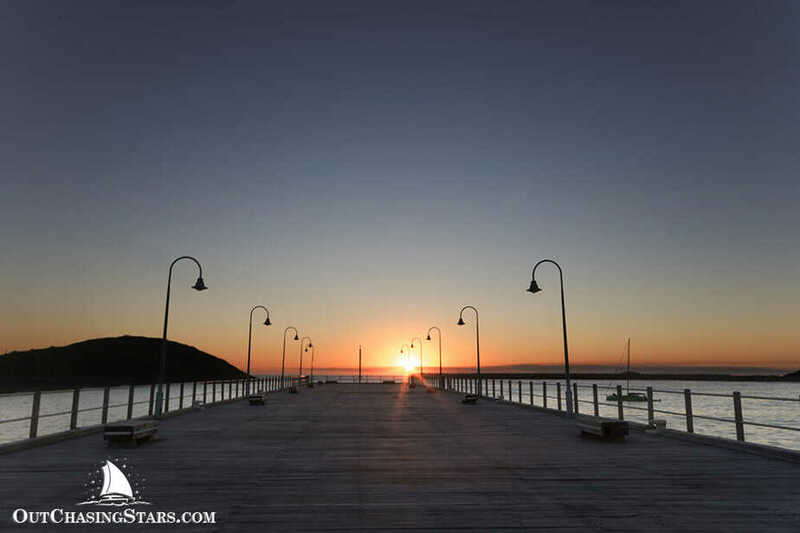 At the end of the drive, the parking lot is directly next to the Forest Sky Pier, which looks out over Coffs Harbour and south. There are covered picnic tables, perfect for a picnic lunch. The view from the pier. See Coffs? Back towards the entrance is the Gumgali Track which leads to the Korora Lookout. 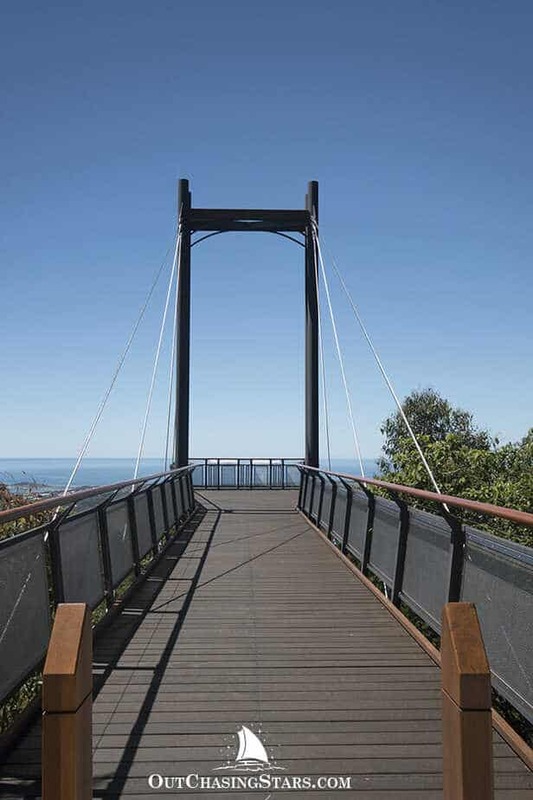 The trail has an interpretive story of Gumgali, the Black Goanna, a part of the local Gumbaynggirr culture through sculptures, murals, and an audio recording at the lookout. We spotted our first Australian bush-turkey sighting (I didn’t even know they had turkeys here). 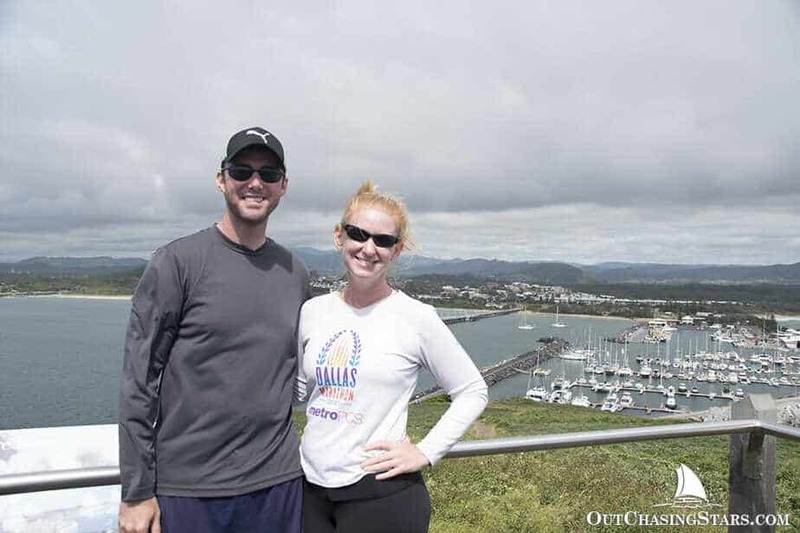 The lookout stands out towards the north side, and would be great to look out over the water and watch whales during their peak season (May – November). The view from the Korora Lookout. The jetty and beach are quite a hub of activity for the locals. Even with a moderate swell coming in (or maybe because of it), the beach is popular for small water craft and surfing. I woke up early one morning to greet the sunrise. Picking out spinach and kale. 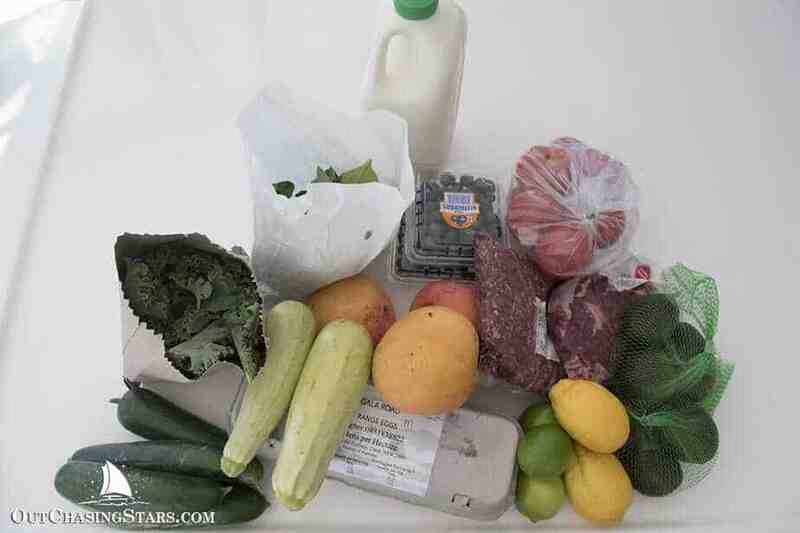 $55 USD worth of goodies: ground beef, steak, cucumbers, zuchinni, kale, spinach, milk, blueberries, limes, melons, eggs, avocados, tomatoes, and mangoes. 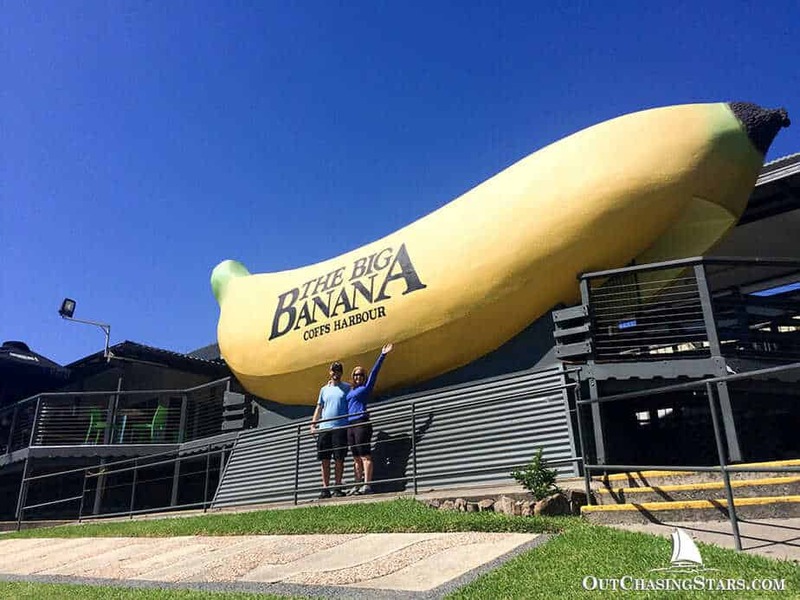 We drove past it three times, so we felt like we couldn’t miss the opportunity to take a photo with the Big Banana – one of the oldest “Big Things” in Australia. Now, the Big Banana is actually a theme-park-tourist-trap with ice skating, water slides, a candy factory, etc. You can pass through the inside the banana, where there were tvs, most of them not working. One assumes they are for informative videos, but that was a bit disappointing. However, at a later stop I found a booklet from the Coffs Harbour Regional Museum that gave a lot of interesting historical information about the Big Banana and the surrounding area. The Big Banana Park started as a roadside stand by John Landi in 1964 (making the banana over 50 years old). Bananas were a main export of the Coffs Harbour area for many years, and the area was even known as the Bananacoast. John Landi handpicked the “best looking” banana, which was cut into slices and scaled up to create the actual Big Banana. My favorite quote in reading about the Landis; “we had a $2 home with a million dollar view”. Australia does not import bananas to protect their varieties from disease, so you always get a Aussie banana here. Just like bananas were brought to Australia and cultivated, so was carob. I didn’t know anything about carob before we stopped at the Carobana Carob Factory, but we got a good education there. Carob is just like cacao – a bean pod. Instead of coming from the Americas, carob trees grew in the Mediterranean. Why was it such a big deal when cacao was brought over from Americas to Europe in the 1500s? I’m not sure, because I thought unsweetened carob tasted better than unsweetened cacaco – it’s a sweeter and milder flavor. But, David’s preference is still the sweetened and roasted cocoa that we call chocolate. At the factory, you can see how they make the carob products, as well as honeycomb toffee, and taste samples of their products. Honeycomb has no honey in it (to our disappointment) and is an very sweet product. We each picked out our favorite – David went for carob mint fudge and I got unsweetened carob covered honeycomb bits. 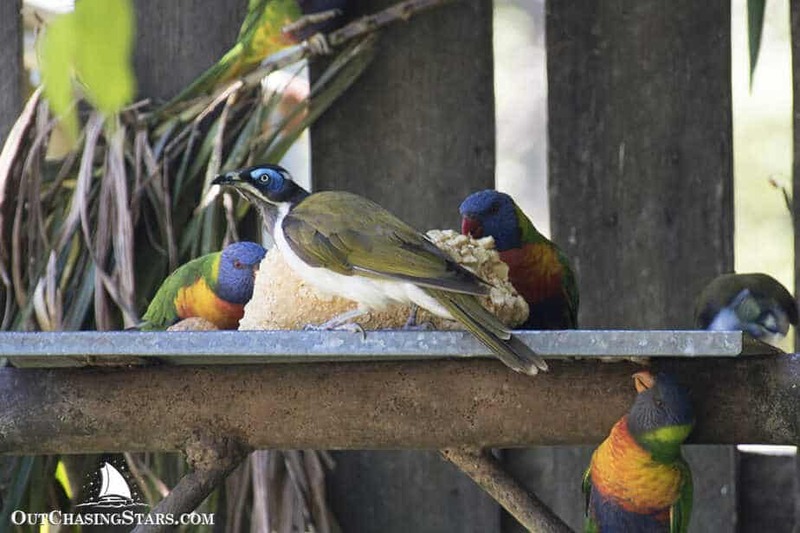 Outside of the factory was a feeding station, where rainbow lorikeets, Blue-faced Honeyeaters, and Australian bush-turkeys (#2) ate. The lorikeets are so damn photogenic. Lastly we came to the North Coast Regional Botanical Gardens for a walk. 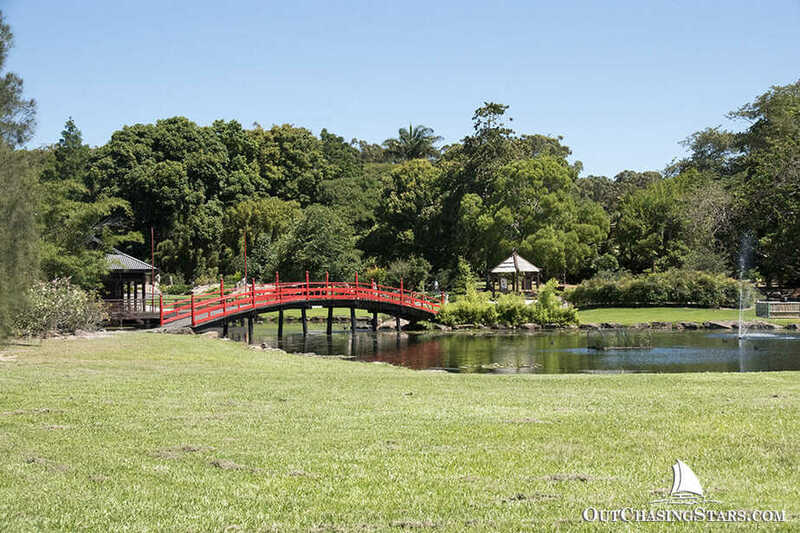 We walked the outer loop, which was a bit of uncultivated forest on the way out, but the second half of the loop took us past the edible garden, the Japanese garden (Coffs Harbour sister city is in Japan) and the sensory garden. 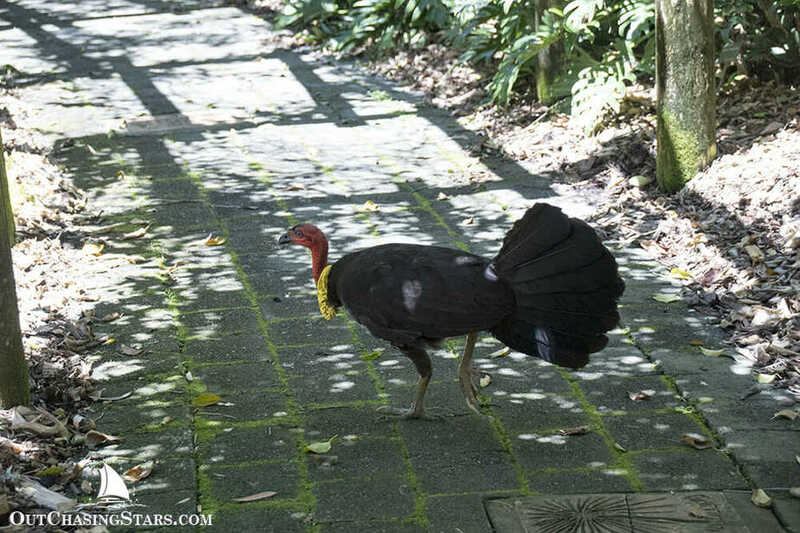 We also spotted another Australian bush-turkey (#3!) and a flock of four yellow-tailed black cocokatoos. Not a very attractive bird. These guys are much prettier. We ate out a few times, as the Jetty drive area is full of restaurants with sidewalk dining. Our favorite place to eat was Twenty46, where we had a Texan burger (maybe not truly Texan but still delicious) and Korean ribs (fall off the bone tender). David loved the banana and honey smoothie and I enjoyed the fresh squeezed juices. We also had pizza at Maria’s Italian Restaurant and a burger at Attitude Burger, but I would definitely recommend Twenty46. 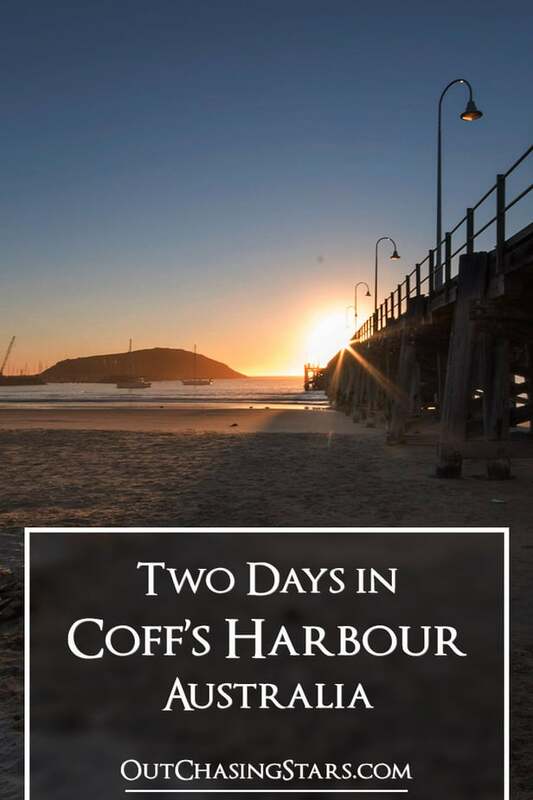 For more information about dining out in Coffs Harbour and reviews, I recommend checking out Gourmet Getaways, a travel and food blog based in Coffs Harbour. A big thank you to Coffs Car Rentals who picked us up and dropped us off for free! 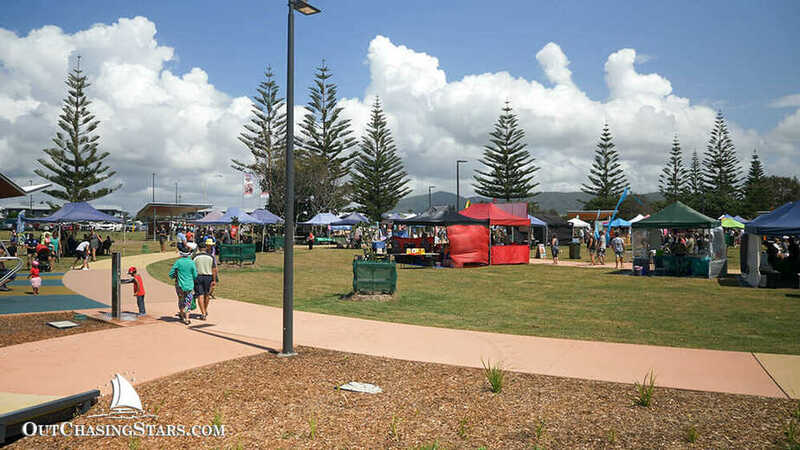 There’s a lot going on in the region around Coffs Harbour that we didn’t get to. A car rental is pretty rare for us, so we felt pretty happy getting out as far as we did. 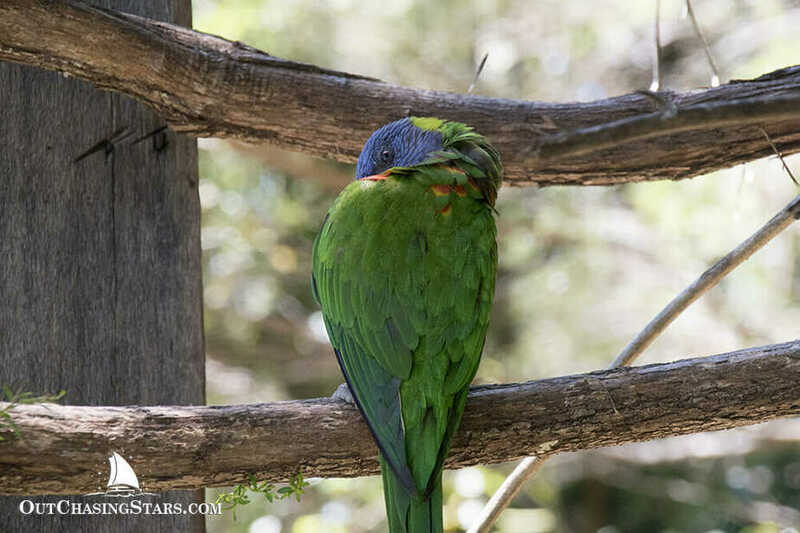 However, there are two big parks that would have been on my list had we had another day with the car: the Bongil Bongil National Park, where you can spot wild koalas, and the Dorrigo National Park where there’s hiking, waterfalls, and a viewpoint. OMG, did you find the kangaroos to be rude? I heard wild ones could be pretty aggressive, but I have always wanted to see one in person! 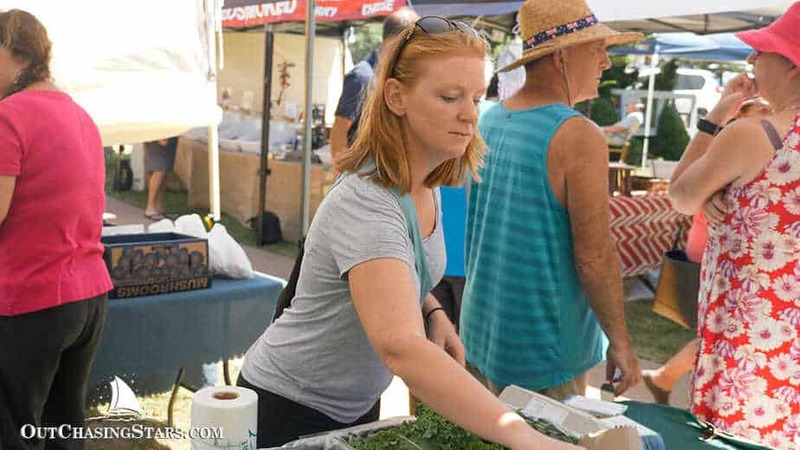 The beaches and markets look like so much fun as well. I love the colorful birds you guys saw! This looks like such a wonderful place – and those Kangaroos are sooo cute! They are! We had such a good time! Small towns are at the top of my list when I travel and this town looks like a great spot with lots of nature-oriented things I like to do when I travel. I’ve never seen a wild kangaroo in the wild and that would thrill me too! Most of our travel is small town or really remote. Sydney has been a little overwhelming sometimes these past few days, but also amazing to see the diversity here. 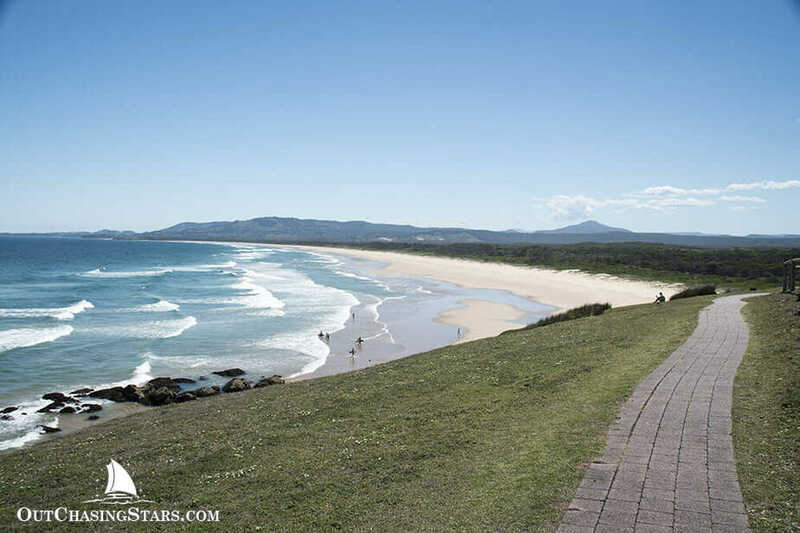 Coffs is a great stop. 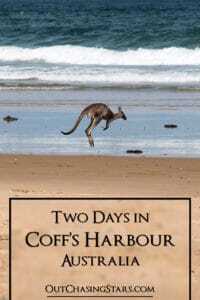 It has been a really long time since I have been to Coffs Harbour! I use to go all of the time as a kid as my mums best friend lives here. This post brought me right back to my childhood. Especially when we use to visit the Big Banana! By the way, they are fantastic photos! Ah, glad I got you all nostalgic. Thanks for the compliment on the photos. You should go back as an adult now and see it with new eyes. You had me at the wild roos; brilliant to see them bounding across the sand. The last roo I saw in the wild was casually browsing by the side of the dual carriageway to the business park in Adelaide, so clearly the roos you saw have a rather more photogenic spot to enjoy themselves. 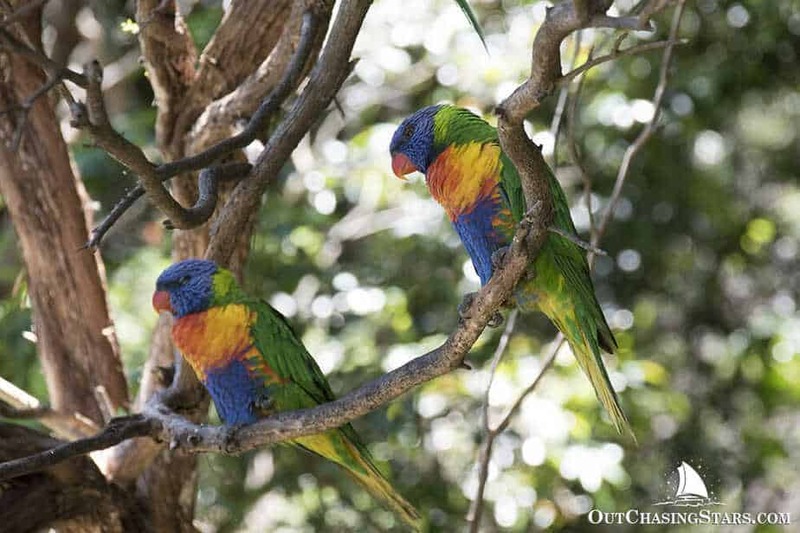 Loving your pics too – particularly the waves and the lorikeets. And I’m more than a little envious of all that great Aussie produce. Thanks Bernie! The roos we’re a big time highlight! 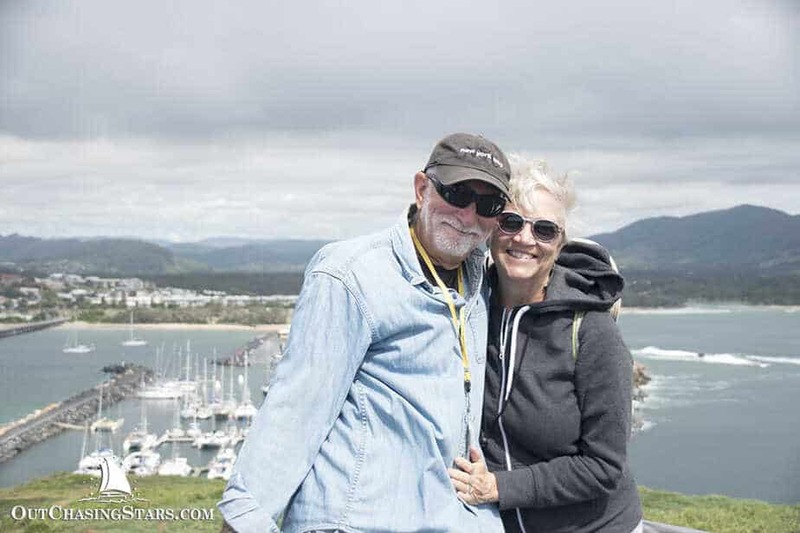 I can’t believe how lucky we were to have that experience so early in our Aussie trip. Right? They are well worth it. And the hikes were so easy. Beautiful pictures! I loved the kangaroos (missed seeing them when I was in Australia last year) and the colorful birds. Enjoy the rest of your trip! Thanks! It was totally amazing to see the roos out in the wild like that. OMG – how beautiful is that place! 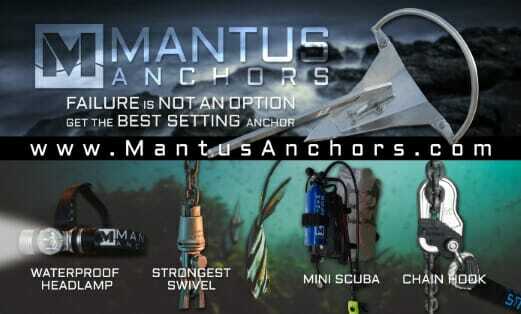 I would love to go there one day!! Oh my gosh, these pictures! I’ve never been to Australia, but this is really inviting. I’d of course love to see the kangaroos, but the birds at the Botanical Garden look gorgeous, too. Never thought about it, that some plants growing there now had to be imported – although it makes totally sense. Very nice and informative post! Thank you! Hopefully you will get to visit Australia someday soon. 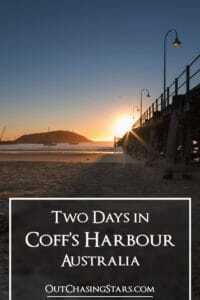 Coffs harbour is a pretty small little town though, not many tourists stop by. I loved seeing all the colorful wildlife — what fantastic photos in this article! 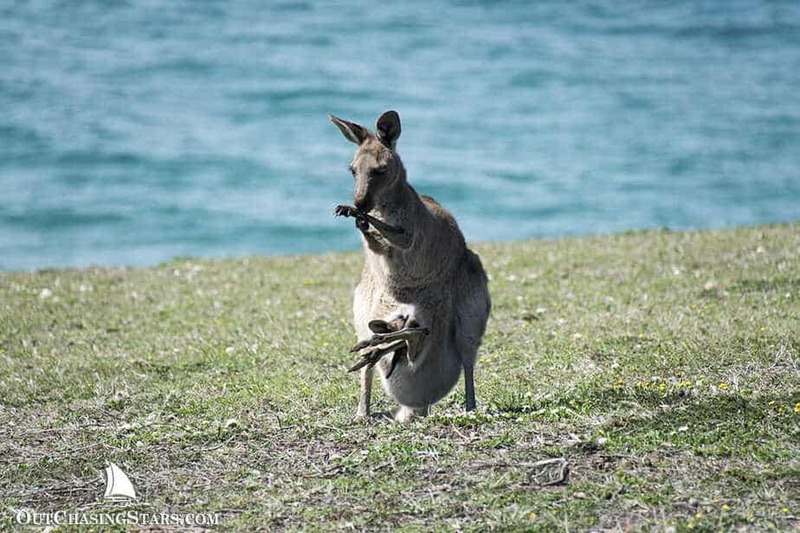 I would love to see kangaroos in their natural habitat, which puts Headlands high on my bucket list. And miles of beautiful beach? What’s not to love. Thanks for such an informative post. I learned a lot! Phenomenal pictures! I can’t decide which I think is most beautiful – the sunrises, the birds, the fruit, or your ‘abstract’ photo (which I love)! 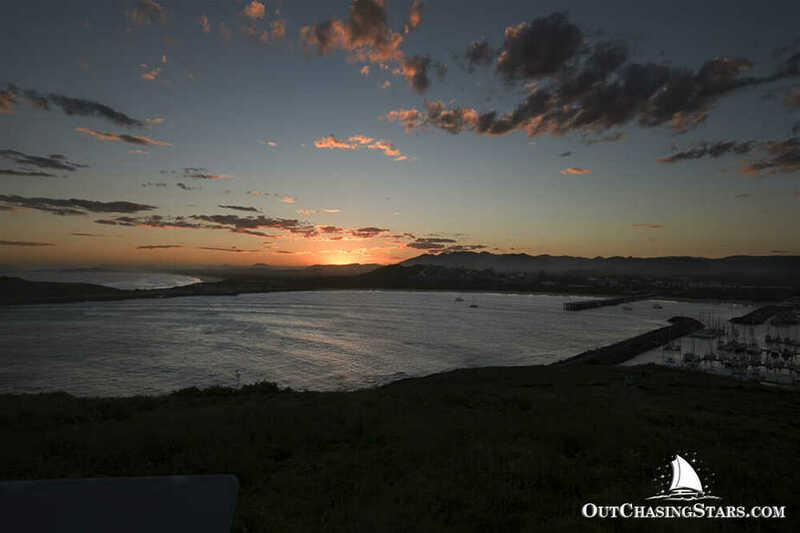 Hats off to you for your photography, Amy, and for your dedication to getting up early enough to see the sunrises! Hugs and counting the hours!!!!! 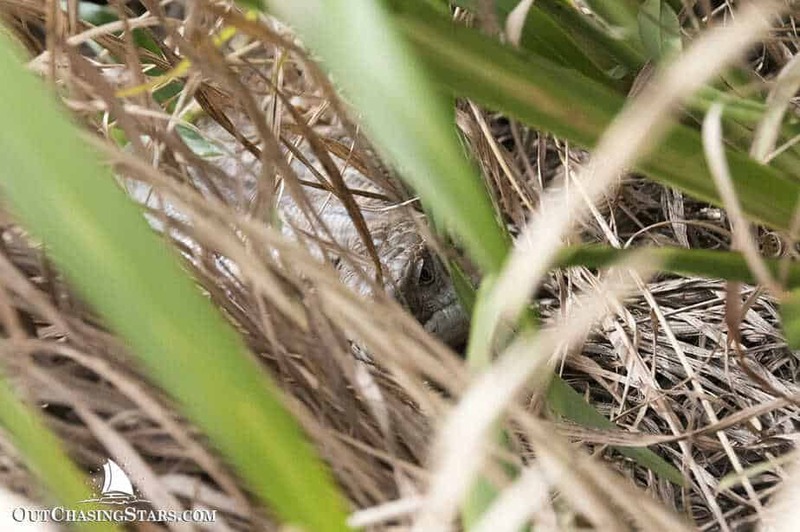 Wow a giant banana and lots of wildlife in this blog post!!! Great post! The birds are gorgeous, but I love the Roos (and saying “Roos”)!